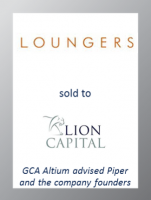 GCA Altium has advised Piper LLP and the company founders on the sale of Loungers, the UK café-bar and restaurant group, to Lion Capital in a deal worth £137 million. This marks GCA Altium’s 35th transaction in the consumer and retail space since 2014, adding to deals such as Prezzo and New Look. Loungers is a fast-growing business founded in Bristol in 2002 by a trio of longstanding friends, Alex Reilley, Jake Bishop and Dave Reid. Their idea was to provide customers with a ‘third space’ between work and home to meet, chat, eat and drink – a more attractive and appealing alternative to the surrounding local pubs and coffee bars. Loungers operates two brands: Lounges and Cosy Clubs. Piper invested in Loungers in April 2012 when the business comprised 20 Lounges and three Cosy Club sites across the UK. Over the past four years, the company has more than quadrupled the number of sites to 95, opening 20 sites a year since 2014 and creating employment for almost 2,000 people. The business is planning to open its 100th site by April 2017 and has a further 20 in the pipeline for the following year. The team behind the business will continue their involvement for the next stage of its growth. Alex Reilley will stay on as Chairman of the group. Nick Collins, who joined as Finance Director in 2012 and became CEO in 2015, will continue to lead the business together with Justin Carter who joined as COO in 2015. Jake Bishop will remain as Managing Director of Cosy Club. GCA Altium has completed more deals in the casual dining space than any other M&A advisory firm in the last 24 months, advising companies including Prezzo, Le Bistrot Pierre and Vital Ingredient.